One look at the stunning architecture of the Savannah Trade and Convention Center tells you that this waterfront jewel isn’t your typical convention facility. Its resort-like setting and spectacular views of Savannah’s riverscape puts your attendees in the right frame of mind to ensure a successful, productive meeting. And when the business is done, the after-hours fun and excitement of the Historic Meeting District is just minutes away. With 330,000 square feet of smartly designed space, the Center provides the capacity to comfortably handle even the largest groups. 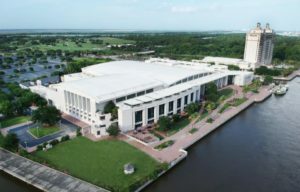 In addition to 100,000 square feet of exhibit space, the Center has 13 meeting rooms, 4 boardrooms, a 25,000 square-foot Grand Ballroom and a 367-seat auditorium—all equipped with the technological amenities you’d expect from an international convention center. The GAMEIS Conference will be occupying the East Wing of the Conference Center next to the Westin.